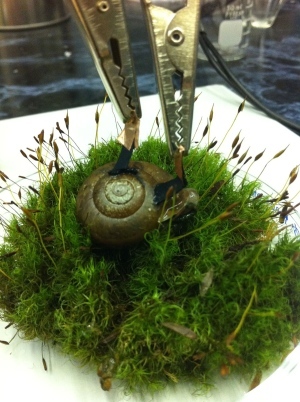 The Fern and Mossery: Do Cyborg Snails Dream of Electric Sheep on Mossy Hills? Do Cyborg Snails Dream of Electric Sheep on Mossy Hills? I'm excited to be able to post from such a classy source. Nature News reports on scientists tapping biofuel power from ordinary garden snails. You can read more about the astounding science behind this project at the link but I'd rather just pause and enjoy that lovely mossy hillock upon which rests that little bio-battery snail.